The gold nugget pleco has the scientific name Baryancistrus xanthellus. However, fish dealers often start selling newly-discovered plecos before the fish in question receives a proper scientific name. Instead, dealers use an "L-number," which often sticks around even after the fish is properly named. Different regional varieties of the gold nugget pleco go by L numbers including L018, L085, L177 and LDA060. The gold nugget pleco lives up to its name in a few ways. It has golden yellow highlights and costs more than regular plecos. A gold nugget pleco has a few requirements for its home. They do best in a tank larger than 30 gallons. They also prefer a planted tank as they may graze on plants. However, they do not devour all plants and their nibbling will probably go unnoticed in most tanks. Gold nugget plecos also benefit from having real driftwood--from a pet store--to rasp on. 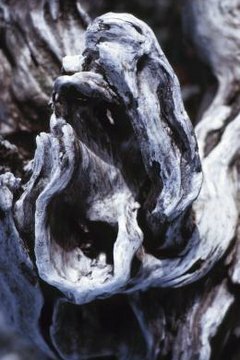 Driftwood from elsewhere could have dangerous chemicals soaked into the wood. Lastly, they need a mature, cycled aquarium; a tank that has been up and running with fish in it provides a more stable environment. Gold nugget plecos come from the northern drainage of the Amazon River. This water has very specific conditions in terms of temperature and pH. They are a tropical species that does not tolerate colder temperatures. They do their best in water from 75 to 85 degrees Fahrenheit. B. xanthellus also requires soft water with a low pH. They prefer water with a pH between 6 and 7. Gold nugget plecos are algae eaters. However, they will often eat all of the algae in a tank. They require supplemental food or they will waste away. Pet shops sell many foods just for plecos, like sinking pellets and wafers. Make sure your foods have a high vegetative content. They also benefit from supplemental feedings of fruits and vegetables, like blanched zucchini and Romaine lettuce. Use feeding clips or aquarium weights to hold these foods near the bottom for the plecos. Gold nugget plecos require some care in the choice of their tankmates. Male gold nugget plecos will get along with most fish, but may fight males of their own species or even other plecos. They get along well with any fish that does not hang out on the bottom. Tetras and any fish that swim in the upper levels of a tank make great companions. Such fish will rarely bother a pleco and it helps balance the composition of the tank.